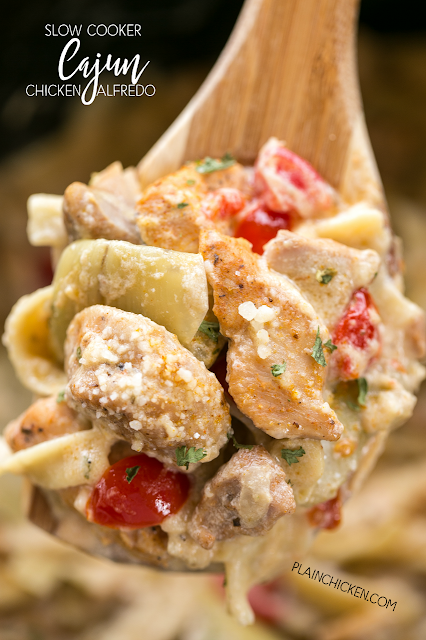 Slow Cooker Cajun Chicken Alfredo - everything cooks in the slow cooker, even the pasta! This is AMAZING!!! Chicken thighs, artichoke hearts, alfredo sauce, chicken broth, egg noodles, parmesan cheese and tomatoes. Everyone cleaned their plates! Definitely going into the rotation! I'm sharing some of our favorite Cajun-style recipes this week in honor of Mardi Gras. 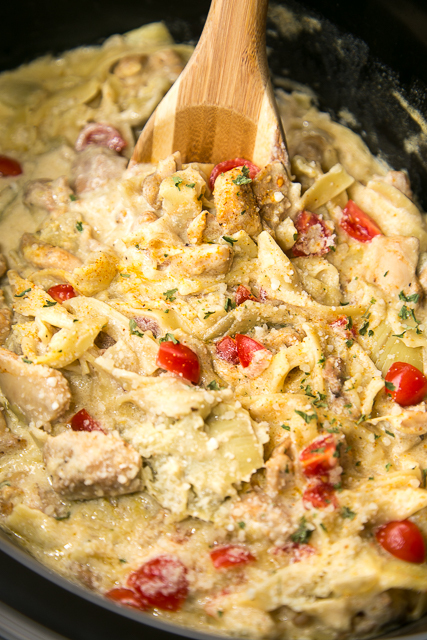 This Slow Cooker Cajun Chicken Alfredo was 5 stars! 🌟🌟🌟🌟🌟 The best part is that everything cooked in the slow cooker - even the pasta. We both absolutely LOVED this!!! I used chicken thighs in this Slow Cooker Cajun Chicken Alfredo. Chicken Legs loves chicken thighs and they add more flavor to the dish. We also added a can of artichoke hearts and some chopped tomatoes. Seriously delicious. We had leftovers for lunch and it was just as good reheated! Feel free to adjust the cajun/creole seasoning up or down according to your personal preferences. I usually use Tony Chachere Creole Seasoning. I find it in the spice isle at the grocery store. Cut chicken into bitesized pieces and sprinkle with seasoning. Place chicken in slow cooker. Add artichoke hearts, Alfredo sauce and chicken broth. Cover and cook on LOW for 5 to 6 hours. Stir in noodles and cook on HIGH for 15 minutes, until noodles are tender. Stir in diced tomato and parmesan cheese. Looks very good Steph and I like the slow cooker prep. I think it would be fine. I don't really like chicken thighs and this was really good. Made this tonight and whole family loved it!!! Yay!! So glad it was a hit!